Looking for some super puzzle fun? Try FlipSide! FlipSide is a challenging and fast-moving puzzle game for the iPhone and iPod Touch. Imagine if Tetris was crossed with match 3, with better colors, sounds, and graphics and you got FlipSide. Matching pieces fall with a symbol on each side — near side (your side) and far side (you opponent’s side). The object of the game is to create at least 3 matches on your side. You have the option of flipping the pieces over by tapping on them. You can also drag falling pieces over to different columns. Match pieces horizontally or vertically to get points! The best part about this puzzle game is the various modes you can play in. Modes include Tutorial, Survival, Puzzle, Vs. com, and peer-to-peer (bluetooth). There is a small learning curve for this game, but the tutorial mode gets you started quickly. It’s simple to follow and explains the game quite easily. I personally would play the tutorial mode a few times before jumping into the other modes. In Survival Mode, you can play until the screen is filled up with pieces. There are over 20 stages in both Normal and Expert mode. In Puzzle Mode, the object is to flip or move the pieces so they all disappear (without the addition of new pieces). This mode requires the most amount of thinking and isn’t timed. There are 20 stages in both Easy and Medium modes. In Verses mode, you play against other players (the computer) and both sides is able to flip pieces to match what’s on their side. There are 5 other players — each one with their own characteristics and strategies. Each player also has 5 different levels to complete. The higher the level, the faster the pieces fall and the more competitive the player gets! Win two games at each level to move onto the next challenge. You can also Play with a friend using bluetooth! This is similar to the Verses Mode, except it’s against a friend. You’ll see pieces they flip over and move around, and they see your moves as well. The graphics are beautifully done and the sounds are just hilarious. I also enjoy how Igloo Software incorporates graphics from their previous games into the next. This game is great for your brain muscles. You have to think fast and plan a strategy. And best of all, it’s highly addictive. So how big of a match can you get? The bigger the match, the more points you’ll get! Flipside is available in the iTunes app store for just $2.99. Note: This app review was recently published in iProng Magazine and Flipside has won iProng’s Best Puzzle App of 2009 Award! If you’re looking for free bargains, select “Free” and “Price Changes”. This way, you will get see all the free apps that recently reduced their prices. See an app you like but don’t want to pay full price for it yet? Add it to your wishlist and select “Notify me of price drops by e-mail. There are a ton of apps in the iTunes App store. Create a list and share the apps you think are worth using. This will help you and others discover new apps as you contribute to the community. If you have an AppShopper iPhone apps list, please share them in the comment box below! Not sure what to get that special someone for the holidays? Not to worry, Target can help you out with that! This Target iPhone app gives you plenty of gift ideas! The first screen asks you to denote if the person is female/male, and the age range. Once that’s set, shake your iPhone/iPod Touch and watch it go! A gift idea will appear along with the price from Target. Not affordable? Shake it up again! And keep shaking it until you the find perfect gift. 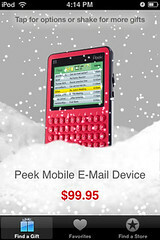 Tap on the gift to save it to your Favorites (Shopping list), or you can buy it directly from Target.com. It also helps you find the nearest Target store. It’s a beautifully written iPhone app, that gives you lots of great gift-giving ideas. The only thing I’d like to see is the mobile version of the Target site being linked when you want to purchase the gift. 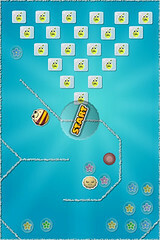 My absolute favorite iphone app game is Dizzy Bee. I first downloaded the free version (iTunes link) and loved it. After beating all of the levels, I had to get the full version (iTunes link). The concept of the game is very simple. You’re a bee who wants to rescue his fruit friends from the terrible monsters. To do so, you must help your friends and yourself escape through a portal hole on each level. You can move your bee-self around by tilting your iPhone or iPod Touch. Be sure to strategize, so you don’t get eaten by a monster! Challenges are quick, so you can play a game with you have a spare minute or two. It’s also great for people who have short attention spans like me! I updated my ipod Touch to the iPhone firmware 2.0.1! It only took.. forever. iTunes was backing up my data — all 8 gigs, which took a very long time. I should have deleted podcasts before the update. But anyhow, the actual install took about a minute or two. Instantly, I noticed that the buttons (apps) responding a lot quicker, as well as the page scrolling. None of my data was overwritten, which is good. Oh wait, my wallpaper was gone, but that was an easy fix. Twitterific still crashes on me though. I’ll go through and test out my other apps this week and will post updates! Til then, happy updating!